Bring your patios, gardens and outdoor restaurants to life with this colorful and modestly-priced Chinese Lantern set. The lanterns can be found in lights > ceiling lights and cost §25 each. These lanterns come in seven colors. They use my partylights lighting mod to cast colored light over surrounding objects and surfaces. If you have already installed my partylights or my illuminated shop signs, you can just delete the lighting file included in this download. Each lantern is attached to a length of cable which is exactly one tile long. 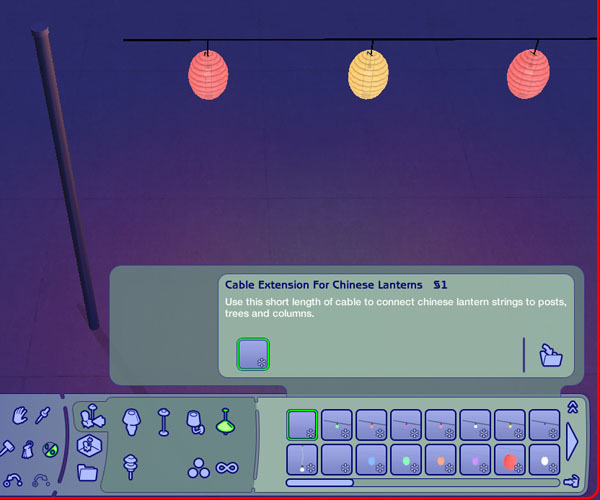 You can string any number of lanterns together in any combination of colors, and attach the ends of the cables to walls, trees, columns, etc. I’ve also included a couple of additional items. There’s a support pole which you can use to hold up the cable ends if you don’t have a covenient wall or tree, and there’s a short length of cable which you’ll need to bridge the gap between the final lantern and the pole. The cable extension piece is grouped with the lanterns in lights > ceiling lights because even though it isn’t a light, it seems to make sense to keep it with the lanterns. The support pole can be found in decorative > sculpture as it has several other uses. 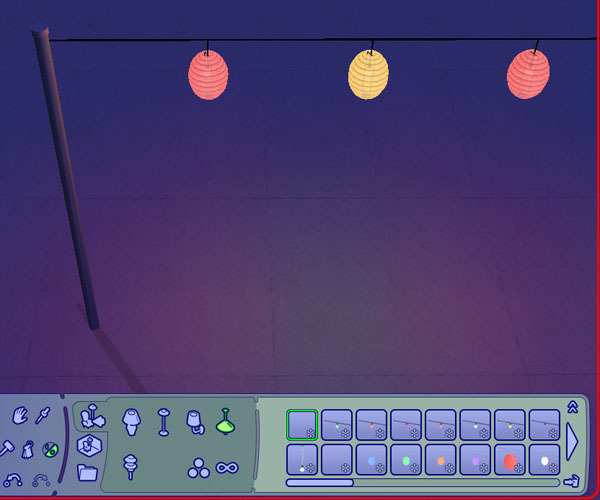 Due to the colored lighting effects used, you must at least have the Nightlife EP installed to be able to use these lanterns. First, place the folder nicvncnt_chinese_lanterns in your downloads folder. Second, we need to tell the game how to create the colored lighting effects. To do this, follow one of the three simple procedures below. You don't need to do anything. 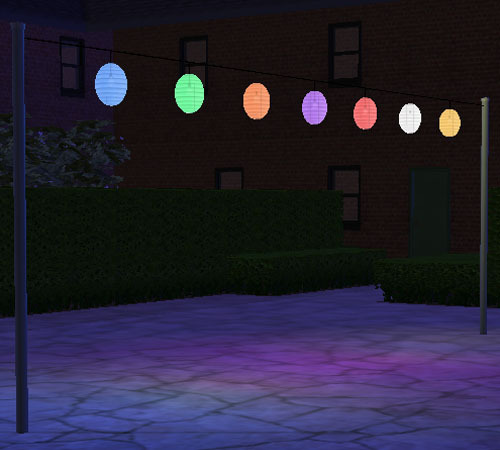 The partylights.nlo file included in this download is a duplicate of the one in your game so you can just delete it. Make a backup copy of the file somewhere safe, away from your game folders. Lanterns don't cast colored light, just a white light which only illuminates objects, not walls and floors? The lighting file is not installed correctly - you need to revisit the installation procedure above. Want to remove the lanterns from your game? You can still leave the lighting file in place - it won't do anything if nothing is using it. Having problems with other lights after installing this mod? Just revert to the backup copy of the lighting.txt file which you made. Want to post recolors or use the lights in uploaded lots? Vivid Waters - 5 New Fountains With Realistic Animations-NO EP!